Will AmishQuilter quilt a quilt top that I already own? The answer to this question is yes. While it will not be a 100% Amish quilt, unless the quilt top you already own is of Amish original, the placing of a previously made top on the base the Amish ladies assemble is physically possible. To make this happen, the Amish quilter will need to know the exact size of your existing quilt top. They will also need to be aware of its condition. Lastly, they will need to know if any of the old quilt is still attached to the quilt top. Knowing the size is vital so the appropriate base for the quilt top can be made. If it still has some or all of the old quilt is also important to divulge so they will know, in advance of receiving the quilt top, if they will have to remove any material before they can attach the old quilt top to the new Amish quilt base. With those two things known, a good estimate on the time and cost can be made. It is the condition of the old quilt top that is the most important for this procedure to be known. 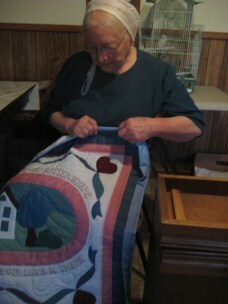 The Amish quilters always do top quality work. If the old quilt top is in need of any repair at all, they will be willing to do it. They would just like to be aware of its condition in advance so they can be prepared for it. It will help them estimate the cost of attaching the old quilt top to the new base, along with the price that will have to be charged for performing this service. 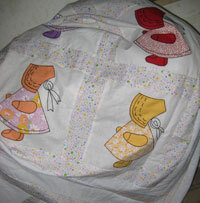 Many owners of quilts are not experts in estimating the true condition of their old quilts. For this reason, you may just want to ask the Amish quilters to do what they feel is necessary. This will include the Amish ladies looking over each stitch that is present and determining if it is in need of replacement. Also, upon attaching the old quilt top to the new base, there may be the need for some embroidery work. Then the readied quilt top is attached to the base in the most secure manner and then quilted. This process is not a simple one, but is just part of the services the Amish quilters are providing. While they are used to making custom made Amish quilts in their entirety, the placing of an old quilt top is not as rare as you might think. Many people love their old quilts and wish to basically have them refurbished. This helps to extend the life an old quilt, which could have many years of memories attached with them. Note: if the fabric is in very poor condition it may not be able to be used and may be need to be replace with a new one. If you are in need of this service, the Amish quilters will happily accommodate your wishes. They will need to know exactly what you want done, or you can just ask them to do the appropriate job in this reattachment process. They will make your old quilt top like new.